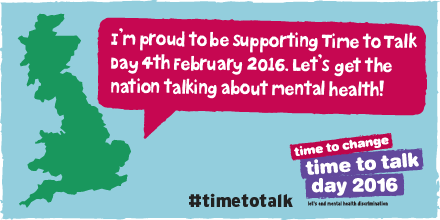 This Thursday it’s Time to Talk day. Last Thursday I filmed a colleague for a video to raise awareness of mental health issues in the workplace and to highlight the support you can get at our company. With mental health being close to home for many reasons, I was honoured to be involved in the video editing for these awareness videos at work and I’ll be working to promote the day across all my social media channels this week. The thing that sparked my motivation to write this post in particular was a comment made during the filming was about work related stress and exercise. My colleague said that during a particularly difficult period he didn’t have time to exercise and this left him even more stressed. Another colleague commented in his footage that he exercises every morning, often doing a 20mile bike ride to ensure he remains positive throughout the day. In the December of 2013 I dislocated my knee (annoyingly for the 6th time) and during the first four months of the following year I was unable to exercise as regularly as I would normally. Typically I run, play netball and visit the gym every week. The week I had off work was around my birthday at the end of April and it wasn’t until I started running again as part of my knee recovery that I realised my lack of exercise during the beginning of that year had significantly contributed to the way I handled work, coped with stress and felt about myself day to day. Having made this connection and therefore understanding what an impact exercise has on me I knew it was something to ensure I did, in particular following a stressful day. Of course in my situation in early 2014, my lack of exercise was unavoidable based on my circumstances but I hadn’t put two and two together and realised that increased stress and tension was due to this. I have always been and now even more so, a firm believer in the power of exercise and the positive endorphins it releases. Just this morning (it’s Sunday evening as I write this) I was a little snappy, but after a 5.7km run I was feeling much better about myself and wasn’t taking out a “grumpy got out of the wrong side of the bed” mood on my family (I visited home this weekend). I completely appreciate that my experiences are no where near as extreme as those of many others, but in the spirit of #timetotalk I wanted to share a least a small relatable experience. I’m proud to support the Time to Change programme, through both this blog post and my video creation and promotion at work. As my Dad has always said, if you hurt your body physically you’d get help from a doctor or otherwise so why not for mental health too? The number of people who are suffering silently should not be ignored and I encourage people across the country and the world to seek help, advice and support from colleagues, family, friends and those who have been through it too. Many workplaces offer support programmes and in particular time to change is encouraging people to have conversations about mental health to help reduce to stigma around it. It shouldn’t be something to be ashamed of and often, as it’s kept so quiet groups of friends and colleagues may not realise that those around them are suffering too. I’ll be tweeting this week both personally and for work. In my role in communications at IBM, it’s important to share this message across my organisation and I look forward to encouraging people to talk and share their stories.